backup a Nokia phone, mobile files and mobile settings? How to convert BIN to ISO image format? How to convert ISO to BIN image format? How to to burn files and folders to CD and DVD on-the-fly? How to convert Visio files to PDF ? How to convert DjVu files to PDF ? How to convert OGM to AVI/MP4/DVD/MOV ? recover contact information from Windows Address Book? How to turn a mobile phone into a GPS tracker? How to burn IMG to DVD with IMG to DVD burner? How to play 3GP files or play 3GPP files ? How to download YouTube Video, convert YouTube to PS3 Zune Apple TV iPod 3GP? This step-by-step guide will show you how to download YouTube Video, convert YouTube to PS3 Zune Apple TV iPod 3GP with ImTOO YouTube Video Converter. Tip: According to your web browser, select the proper way to add the new task. The following web browsers support Drag&Drop and RightClick download. 2. Browsers based on the IE engine in Windows 98/ME/NT4/2000/2003/XP, such as Maxthon,etc.. The following web browsers do not support Drag & Drop and Right Click download. 2. Browsers not based on the IE engine in Windows 98/ME/NT4/2000/2003/XP, such as Firefox, Opera, Orca,etc.. 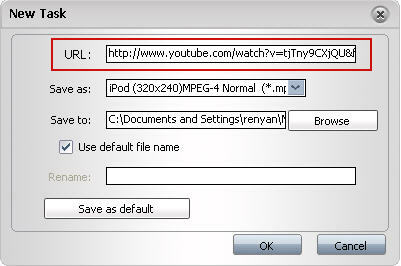 Otherwise, you can convert an FLV file on your computer to other video formats by adding a local URL. Tip: Click "New" button in the tool bar to open the "New task" window. 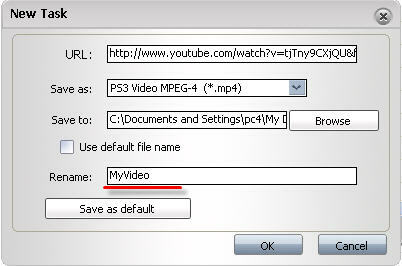 ImTOO YouTube Video Converter can convert YouTube to PS3, Zune, Apple TV, iPod, 3GP, PSP, AVI, SWF, MPEG, etc. In "Save as" drop list, select the output formats which you want. Step4. Select the output destination Click "Browse" button on the right of the "Save to" box, select the destination where you would like to save your output(converted) video file in the "Browse for Folder" that appears, and then click "OK". Step5. Rename the output file The software supports to rename the output file. To do this, uncheck the "Use default file name" option and enter a new name for the output file into "Rename" box. Tip: The "Use default file name" option is checked as the default. Step6. 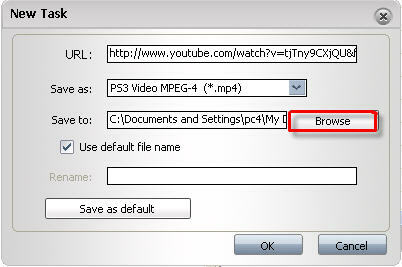 "download and convert" video Click "ok" button to close the window, and then the program will start a new "downloads and conversion" task automatically. Tip: You can manage the tasks that have been added in the task list, such as "start", "stop", or "delete" the selected task. After the upper settings, click "Save as default" button to save these settings as the default in the next adding as you need. After the conversion, you can playback the output file in the independent "ImTOO FLV player". Step 1: select the task you want to view in the task list, and click "Play" button in tool bar. Step 2: Click "Play" button to playback the selected output video in "ImTOO FLV player" window that appears. Select a task in the task list, click "File Info" button in the tool bar, and then get information of the output file in "File information" window that popped-up. How to convert DVD to iPhone Video MP4 step by step? How to convert and burn VOB AVI to DVD step by step? How to convert video files to iPod format step by step? How to copy DVD and play on PSP step by step? How to copy DVD movies with dvdSanta step by step? How to rip DVD and put DVD on Zune step by step?